Today is The Sous Chef’s birthday. Yap, he is a Taurus and Gemini cusp baby and represents both signs rather well! Since today is his birthday, I am going to tell you yet anther humorous West meets East story within our relationship. 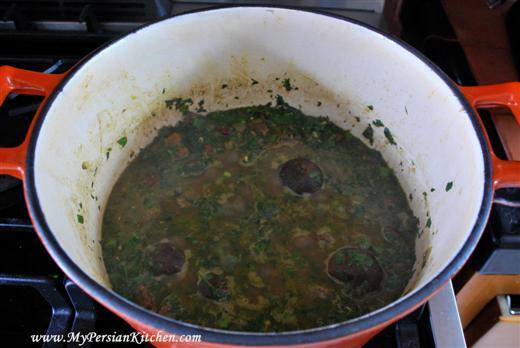 This one involves one of the most beloved Persian stews, Ghormeh Sabzi. If you thought the one I shared on the Sabzi post was funny, this one by far tops them all! I think after you read this one you will agree with me that he is super lucky that I continued to date him back in the day! When I first met him, one fine day we made our way to Westwood to go to Shaherzad Restaurant for what was to be his first Persian meal. Of course I was super excited to introduce him to our cuisine. I love going to Shaherzad because they bake their own bread in the oven in the back corner of their dining room. We parked our car in one of the side streets and let our noses lead us to the source of the delicious smell of Persian food that lingered in the air. We were seated at our table for two and a basket of fresh out of the oven bread was placed immediately on our table along with some butter, and a whole white onion with the skin removed. The Sous Chef’s reaction to the onion was the first comical event of our dining experience. I explained to him that traditionally in Persian restaurants, and households, layers of onion are eaten along with the food. We opened our menus and I offered some suggestions on possible dishes that he might find appetizing. I should add that during that time The Sous Chef was on his favorite diet where he avoids carbs and sugar because he has a sensitive stomach. Needless to say that he only took a small piece of the bread just to try it. I suggested trying a Kabob dish and ordering a salad on the side instead of rice. He went through all the dishes and finally settled on Ghormeh Sabzi. 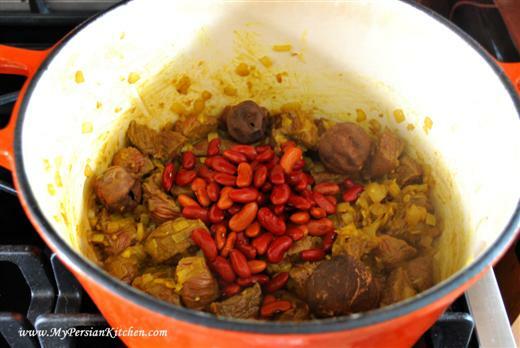 I was a bit concerned about his choice because this stew can be sometimes a hit or miss with non-Persians; some people simply love it and others simply hate it! But he was absolutely sure he wanted to try it because it sounded so good. I reminded him that the stew comes with rice. “But… but you eat “Persian” stew over rice, always. You can’t have khoresht without rice,” I replied horrified. “Says whom?” said he with a mischievous smile. Just then the young waiter approached our table to take our drink and food order. I asked for the usual: Doogh for drink; The Sous Chef asked for a soft drink. When time came to order our food I went ahead and ordered Jujeh Kabob and The Sous Chef did the unthinkable. He ordered Ghormeh Sabzi with salad….no rice. The waiter’s expression of disbelief was priceless! “You want Ghormeh Sabzi without rice? ?” asked the waiter bewildered glancing back and forth between me and The Sous Chef. He clearly recognized the fact that I was Iranian and I know it in my heart of hearts that he was waiting for me to jump in and put a stop to this insanity. In the mean time I just wanted to roll down my chair and hide under the table, or better yet for the ground to open and for me to melt away. I just kept my head down and completely avoided making eye contact with the waiter. Seriously, how dare he insult my people’s food like this?!! The food came and The Sous Chef ate the first spoonful of Ghormeh Sabzi and his eyes widened in delight. He ate the entire bowl spoonful after spoonful along with onion layers with much gusto. I just watched him eat and shook my head in disbelief. And to top it all off he even ordered a glass of Doogh for himself after having tasted mine. Oh my, what an experience that was! He should seriously consider himself lucky that I continued going out with him after his shenanigans! Now onto our recipe! Let me begin by saying that this recipe is the first of a few as far as Ghormeh Sabzi is concerned. There are a variety of recipes for this dish. Some people only use herbs, some people use leeks, and others use spinach in this dish. Today’s recipe is made in the most simplistic form of it: with herbs only. Please note that for this recipe you will need to soak your beans for a few hours. Small dice onion and mince garlic. Sauté in oil until translucent. 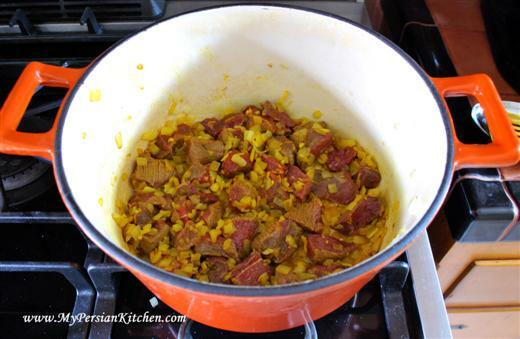 Add turmeric and stir well. Cut meat in cubes and add to onion. Season with salt and pepper and allow to brown on all sides. Make a couple of small holes in each of the dried limes. Add to the meat along with the beans. Add 4 cups of water, cover, and cook on medium for 1 hour. In the mean time fine chop herbs. 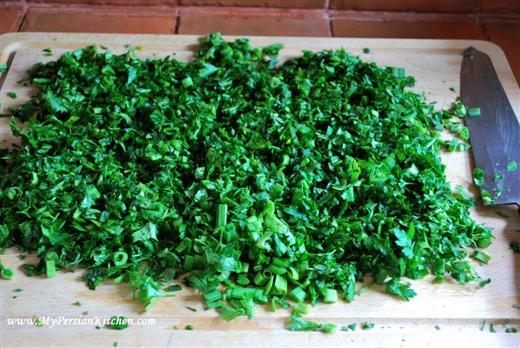 Sauté herbs in oil for a few minutes until you smell the aroma of the herbs. This is a very important step in making this recipe. I highly recommend that you don’t skip it because it really does make a difference in the taste. Add herbs to the meat and beans. Cook covered on medium low for 2 to 2 1/2 hours. Make sure to stir the pot every so often and also taste and adjust seasoning. Note that some people either add lemon juice or ground dried limes to Ghormeh Sabzi along with the whole dried limes. Personally, I find that the four dried limes add enough tang to this stew. Serve over chelow, white rice. Soak beans for a few hours. Small dice onion and mince garlic. Saute in oil until translucent. Add turmeric and stir well. Cut meat in cubes and add to onion. Season with salt and pepper and allow to brown on all sides. Make a couple of small holes each of the dried limes. Add to the meat along with the beans. Add 4 cups of water, cover, and cook on medium for 1 hour. In the mean time fine chop herbs. Sauté herbs in oil for a few minutes until you smell the aroma of the herbs. This is a very important step in making this recipe. I highly recommend that you don’t skip it because it really does make a difference in the taste. Nicole, you can buy frozen chopped herbs at Persian stores. The other option is to make it yourself and freeze it for later use. I just wanted to say I love your blog. I am Iranian-American (half-half) and grew up in California. I have recently been trying to make more Persian food and I didn’t learn many recipes growing up. Your recipes are so easy to follow! I now live in NYC, and I have not been able to find fresh shambalileh, but I did, after much searching, find some that is dried. Any advice on how to prepare it before using it for ghormeh sabzi? I am doing a trial run before I cook a big Persian dinner for a bunch of people in two weeks. Shar, you throw in dried herbs along with the fresh ones. Just make sure that you don’t use too much, as not only dried herbs are stronger, but shanbalileh can totally take over! Hi there, thanks so much for the recipe, it looks great! I’m not Iranian but I LOVE Persian food. I’ve managed to get all the ingredients but I can’t find the dried whole limes near where I live. I’ve managed to buy some dried lime in powder form. How much of this shall I put in if I don’t use any dried whole limes? Leah, I would add 1/2 teaspoon per needed dried lime. you should fry the vegetable first do not use the veg uncooked. taste will be awful it must be dark green with lots of oil on top of it. it’s not a proper way to cook a traditional Persian food. Thanks a lot for this insightful website, I really enjoyed it. I had a question though. Is it “feenigreek” or “fenugreek” which is I assume equal to our shanbalile? Love love this stew!!! 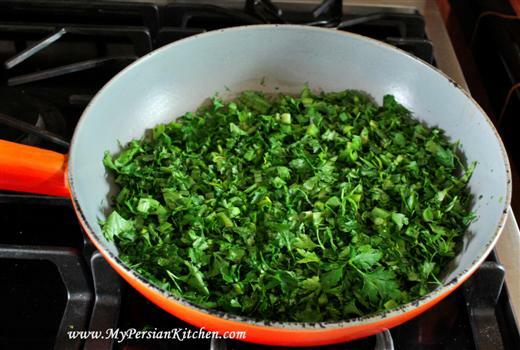 AND THE ONLY WAY TO GO IS FRESHHHH HERBS , I now sit with my laptop watching my shows while I “sabzi pak mekonam” its a modern day twist to the good old traditions in Iran, where I remember my grandma and aunts would sit and chat for hours doing it!! ….I do make this in the crock pot and cook it for like 6 hrs..do you recommend that? Salma, I know exactly what you mean. I cleaned my Norouz Sabzi on my own while watching my fav shows! I have never made Ghormeh Sabzi in a crock pot, but I have a feeling that it would be good since this stew, the more it cooks the better it gets! Your sous chef is adorable! can u also use “Shoombool-lileh”? hi so im not persian im latina but im married to an iranian and currently live in iran. so i came upond this recipe and decided to give it a try becouse i love ghormeh sabzi. it came out perfect my husband loved it thank you. Ali, yes, you sure can! I am first generation in the US of Iranian parents. This is my absolute favorite dish! My mom is not so good at giving me recipes as she has been cooking for so many years and doesn’t measure anything and I am the type that needs a recipe! Thank you so much for this. I have to admit that I often cook meals based on what I have on hand and fresh herbs make this dish need planning ahead which is only good on certain occasions for me. Is is possible to give the dried ingredient equivalent for this recipe? Sarah, I hear ya, the fresh herbs make this dish a bit more time consuming that needed. To be honest with you I have always made it with fresh herbs so, I would have to make it again with dry ones in order to give you an exact amount for each. We made delicious ghormeh sabzi recently using garden cilantro, parsley, onions, garlic chives, garlic, dill, sorrel, and CSA chard for the stew. It was what I had on hand from my garden and since I’ve never even tasted the dish before I had nothing to compare it to but I think the sorrel enhanced the lime taste. WONDERFUL dish. Now I’m doing a sauté of the remaining garden garlic chives & cilantro and freezing them for the next batch of delicious stew. Thank you once again for your inspirational blog. I love your site and use it a lot. Thanks, so much. 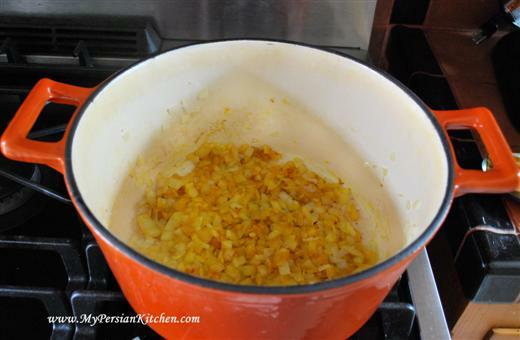 I want to make Khoresh-e-ghormeh sabzi, but I haven’t found limoo on the East Coast. I’ll be in LA in February, but I can’t wait! Do you have any suggestions for a substitution? I’ve loved this stew since I had it the first time with my now husband at Cafe Caspian in Houston. I found your recipe last month and have made it twice since then. It’s delicious! I don’t know much about Persian food (except that I love eating it) and couldn’t believe it turned out so great! Later this week we’re going to try our other favorite dish, fesenjan, using your recipe, and I can’t wait! Thanks so much for sharing! I live in Austin and can’t visit Cafe Caspian as much as I’d like to and we haven’t found good Persian food here in town, so it’s delightful to discover we can actually make these delicious stews at home! One note for others- I couldn’t find fresh fenugreek in Austin, so I used all fresh herbs except for dried fenugreek, and it still turned out delicious. (though I’m sure it would have been even better with fresh fenugreek!) Thanks again! I like to use lemon grass and kale I think turnip greens might be an awesome addition.a little southern touch from Florida. We are going to make a persian dinner using this Ghormeh Sabzi recipe and would love to know about how many people this would serve, just a guess. We will be serving your Shirazi Salad, rice with saffron, Kashke, persian bread, yogurt a plate of herbs and radishes, and some sumac. Could you please note on your wonderful recipes about how many people each recipe would serve. Thanks very much. Hi! I am an Iranian who in her quest to cook more persian dishes, has regularly come back to your site. Your recipes are always almost identical to those my mum gives me, except with more directions! I noticed that someone already asked this question and I’m wondering if you’ve had a chance to figure it out – on my last trip to Iran, I bought ready-made dried Ghormeh Sabzi herbs, except I don’t know how much of the bag I should use! Do you have any ideas of how much would be needed for a normal serving? Thanks! Azadeh, I have not made Ghormeh Sabzi with dried herbs as of yet. But if you have a dried mix I would start experimenting by using 1 to 1/2 cups of dried herbs per recipe. 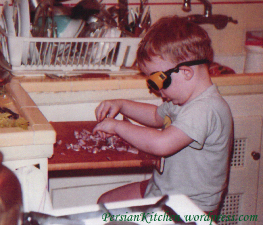 Your story about the sous chef is hilarious and so memorable, it was the story I remembered and associated with your website from the very start when I stumbled upon your website in search of some iranian recipes. Today, many months later, I decided to make ghormeh sabzi for the first time (which was divine, by the way) for my boyfriend who is Syrian and myself. Unfortunately I was short of time and couldn’t make rice – so I made a nice salad and decided we’d eat the ghormeh sabzi with the rice after my class, because that’s the only possible way to eat it, of course, when suddenly my boyfriend takes a taste of it and goes, ‘I don’t want rice with this, I want to eat it on its own!’ and I just stand there horrified and immediately remember your story and all I could do was laugh, so I felt I had to share this with you – to thank you for the wonderful recipe, which my Syrian boyfriend enjoyed with just some bread which he used as a spoon, and for the good laugh! Ebtisam, I am so glad your khoresht came out well and I am laughing out loud right now. This feels like a Deja Vu!!!! What is feenigreek? I know what fenugreek is and have it in a ground form. I have also seen the whole seeds. I want to make this in a few days and hope to hear back from you soon. I have had this dish in Persian restaurants in California, but have not found a Persian restaurant in New York where I live now.. I desperately want to make Ghormeh Sabzi ~ Persian Herb Stew but need to know what feenigreek is and what forms it can come in (ie, seed, ground, fresh herb, dried herb). Craving this dish. Lisa, fenugreek is an herb. It can be either fresh or dried. Hello!!! I am so excited about making this dish!!!! I am not Iranian but had an Iranian boyfriend for nearly 4 years and I lived with his whole family for two years and his mum cooked Iranian everyday and I loved this so much, I am also 5 months pregnant with his child so I’m going to have a half Iranian little boy so I am desperate to learn dishes to feed him!!! I was wondering though, his mum use to have a huge bag if dried herbs called ‘sabzi’ straight from Iran that she said she couldn’t get here, is there a herb called sabzi or would this have been a mixture of herbs?? I once had a great drink made with cantelope and poppy seeds. Is there any chance you know how to make it? Please advise. I would really appreicate your help. An older persian woman served it to me once and never forgotten about this non-alcoholic drink. It’s really the bomb. Thank you!! Sophie, sabzi means herbs. So what she had was probably a combination of herbs used for either Ghormeh Sabzi or any other dish that require that specific combination of herbs. Sharon, not sure about cantaloupe and poppy seeds…I have heard of rosewater and poppy seeds before though…. Thanks away!! 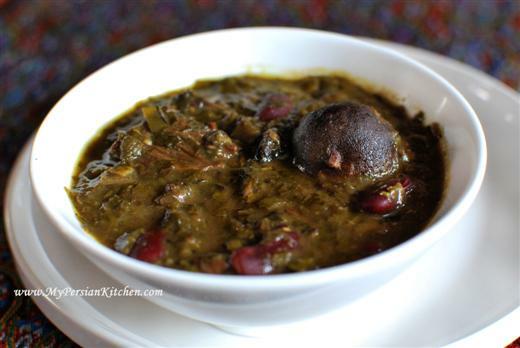 The above recipe for Ghormeh Sabzi is my husband’s favorite. I never dreamed I would find the home-made recipe. You are a real gem!! Can I make this recipe without the beef cubes, since I am a vegan? Could I increase the kidney beans for more protein? Thank you very much!! It’s crazy how often I come to your website to look up a recipe–thank you so much!! I had a question for you about gorme sabzi, how do you feel about it being made with meatballs? I always make with beef–and I was asked to make some for a friend (for a charity event) and when I sent my dh to the store he got ground meat thinking that it was what I wanted…do you think it will taste good with meatballs or should I make sure to run out and buy regular beef? thank you so much!! Neomi, you probably can, but it’s a lot more work. If you make meatballs, make sure to season them with salt. Sharon, yes, you can definitely increase the amount of beans instead of using meat. I made this but it was bitter? What do you think I did wrong?!! Aim thinking maybe I burned the herbs ? I really enjoyed making Ghormeh Sabzi and found your recipe very useful. Do you have a recipe for Khoresht-e Bademjan? About the fenugreek. I live in Spain and it’s hard to find a lot of spices including fenugreek and even tumeric! To make ghormeh sabzi I sometimes just use a curry mix. The main ingredients in most standard curry mixes, at least in Spain, are tumeric, cilantro and fenugreek (in that order). I end up with a little extra mustard seed and cardomom – but the end result is still tasty! Thank you so much for posting this!!! It came out so good, my half-Persian husband loved it! It was my first time making Gormeh Sabzi and I will def. do it again. I had one question though: instead of fenugreek leaves, can you put ground fenugreek seeds? I bought those by mistake before buying the leaves… Thanks!!! Abi, I would say no, it’s best to use either fresh or dried fenugreek. I lived in Los Angeles for about 10 years and my neighbor’s wife used to make Sabzi for me every couple of weeks, this recipe is spot on. Now that I’m back on the east coast it’s nice to bring back old memories. Thanks a ton. Hello. Looking to make this soon for my first time. If I want to make the dish vegeterian, would the cooking time change? If so, what would you recommend? Thank you! Love your website! !